The "Hand Sweep" is nothing more than the old Wing-T “bucksweep”. For the Hand Sweep, motion is optional, but used to hold the backside defender with fake reverse action. The H-back blocks the same as power option, and looks to log the DE. With Hand Sweep, the H-back is more man-conscious, looking to kickout the DE if he takes an outside-upfield path. The H-back can be replaced by a tight end with no change (reach block) in assignment. Split End – who is the bigger, physical wide receiver (Y) cracks first backer in the box. Backside Tackle will hinge, like he does in power and counter. Center blocks back, like he does in power and counter. Playside Guard – will pull to block the support defender. If the defense is in man coverage (the Y receiver’s defender chases him inside), the guard will look to log the first backer to clear. If the defense is in zone (the support player just sitting in the flat), the guard will kick the defender outside. Backside Guard - the backside guard will skip pull to pick up the backside linebacker scraping over the top. If this backer tries to run-through the open playside A-gap, the guard will pick him up. If the backside backer shoots the backside B gap, the guard will not pull and just pickup the linebacker. One of the better methods of defending Wing-T is by matching numbers with a reduction (Under) front, making it difficult to get enough blockers at point of attack. To accommodate for this front, as the playside tackle would have a terrible angle to account for an A-gap defender, the playside guard will make an “IN” call. This communicates that he is staying “in” (not pulling) and adhering to his A-gap track. This now reverts back to how power is blocked, with the exception that the backside guard will now be pulling for playside defensive support player. Good to know that, H-back blocks the same as power option, and the information is just great. Not exactly same as Wing-T bucksweep -- no trap fake. Closer in execution to the old Lombardi Power Sweep, down to the block by the FB. So the backside LB can keep the backside G home by faking a blitz? that depends....can a fake MLB blitz get a center to not help with a shade nose? What if we have the QB execute the trap phase off the sweep fake? 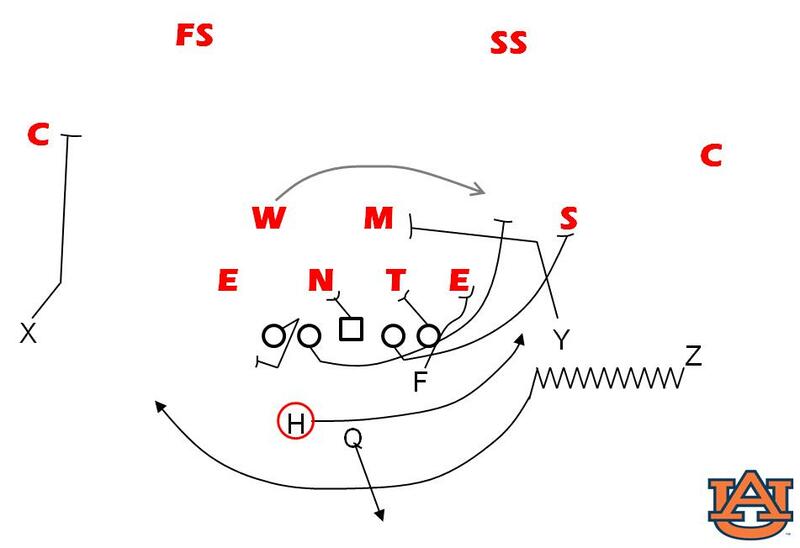 Very similar to what many are calling "Flash" or "inverted veer". True, true. But if the "IN" call is on, and the BSG stays home to protect the BS B gap, then there is nobody left to kick out the force, right? To step back a bit, how is the BS 3 tech handled vs. the Under? vs Under; OC still takes the backside A track and simply has to cross the face of the 3 tech. If the 3 tech would have to stunt away from the call to not be blocked, because if he follows the track of the BSG it will lead him into the center's block. No one is kicking out at the point of attack (logging EMOL), as much as the first puller will attack the force player. The leverage he is sealed with depends on the position of the force player. the "in" call has to do with playside, not backside. the analogy I offered in the comments was refering to BOB pass pro (my mistake for not writing it out). Where are you in the Atchafalaya Basin? Do you have playoffs tomorrow? If the defense is playing an Under and blitzing both inside backers.....well, there might be a dozen other options for the offense to use. At Tulsa, the Power Option (and I'd assume at Auburn) was an audible check available anytime the QB saw man-coverage (which is what you'd be getting when you're throwing so many bodies into the box). You can still pull BSG against Bear fronts, though. These articles have enhanced my enjoyment of the Georgia-Auburn game. What about running it against an Odd Base (Nose and 4i's)? Would this be considered an Under Front, thus an "In" call from the PSG, who'll block the nose and the C block back? Or would the BST hinge the 4i? We've played a few teams with 4i's who will read Guards and chase the pull, and our tackles might be too slow to cut him off. Center aims high on the nose. Great information love this post. Keep posting.